Ronnie Carroll was a Belfast-born singer whose style owed much to American crooners and who enjoyed considerable popularity in the 1960s. The son of a plumber, he began singing in local pubs and clubs and, in 1953, aged 19, he moved to London. Early tours with The Hollywood Doubles Show saw him imitating Frank Sinatra and blacking up as Nat King Cole and Billy Eckstine. His own light and grainy baritone also attracted attention and, with it, a recording contract. His marriage to Millicent Martin in 1959 conferred on the couple a tabloid glamour until their divorce in 1964. Carroll’s first hit, 1956’s Walk Hand in Hand, saw him in the Top 20 and television soon beckoned. An appearance on the first episode of Oh Boy! 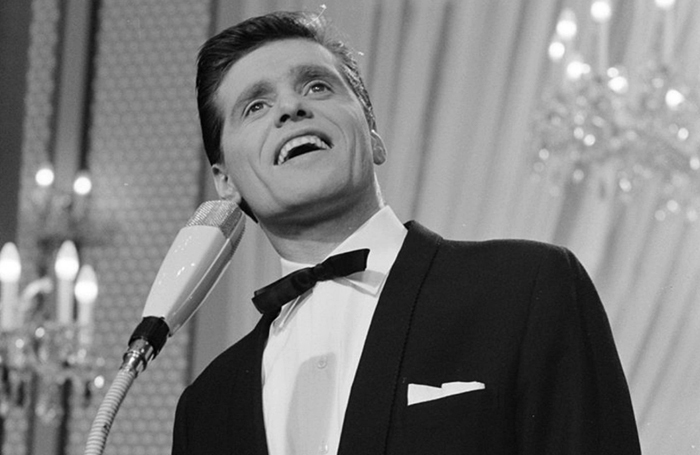 alongside Cliff Richard and Marty Wilde in 1959, together with the No 3 hit Roses are Red (My Love) in 1962 cemented his status as a bona fide pop star. Carroll was the only singer to represent the UK in the Eurovision Song Contest in successive years, coming fourth on both occasions in 1962 and 1963. When his fame faded virtually overnight in the wake of the Beatles’ transformation of pop music, Carroll emigrated to Grenada to open a hotel, returning home when the country descended into political chaos. The adventure led to bankruptcy in 1974, reducing him to running a hamburger stall in London’s Camden market. In later years, Carroll became an inveterate parliamentary candidate. He had been due to contest the Hampstead and Kilburn seat for the Rainbow Alliance in May’s general election. An attempt to break back into showbusiness stalled with the failure of his 2005 album Back on Song. Born Ronald Cleghorn on August 18, 1934, Ronnie Carroll died on April 13, aged 80. He is survived by four children from his second and third marriages.